EDIT: Updated with a video! 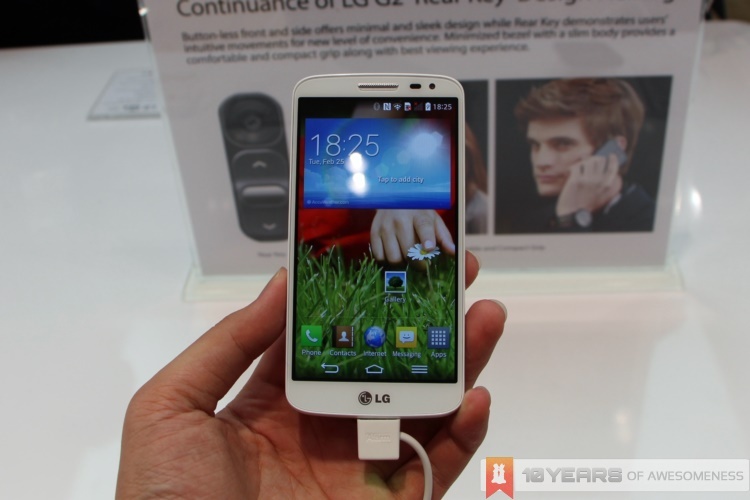 The other Korean giants, LG, has entered the “mini” smartphone bandwagon with the announcement of its new G2 Mini. 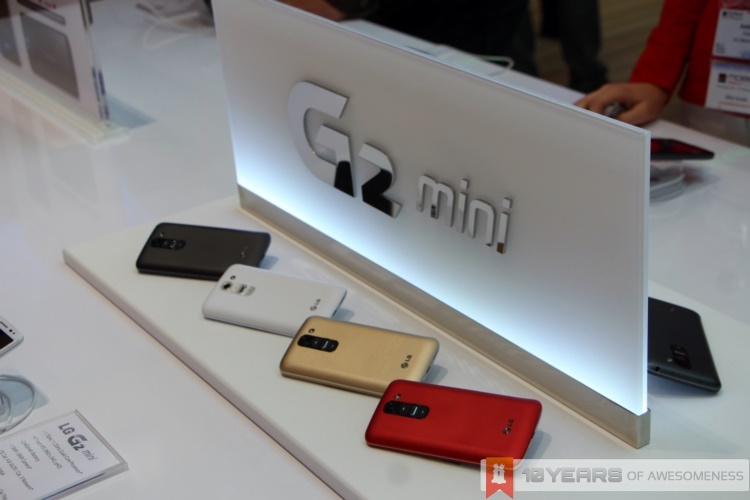 Based on its very successful flagship, the G2, the G2 Mini is being showcased here at the LG MWC booth in the same breath as its flagship phablet, the G Pro 2 as well as its curved G Flex. 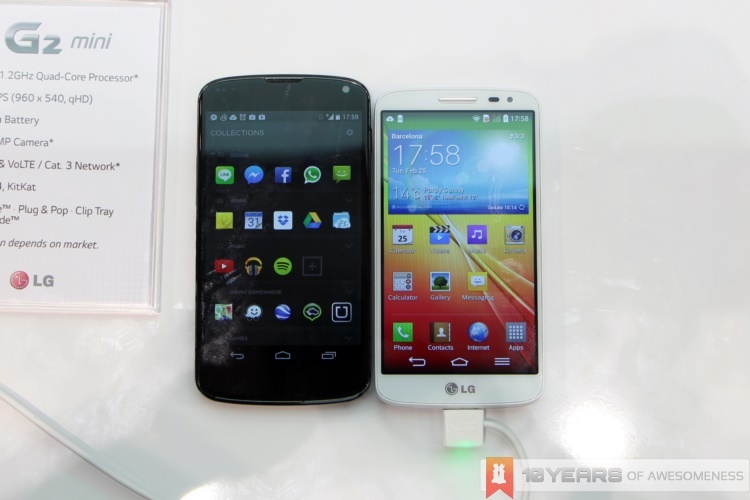 It is interesting to note that the G2 Mini will come in two variants for different markets around the world. The first variant, for the major European and Asian markets, will be powered by a Qualcomm Snapdragon 400 1.2GHz quad-core processor with support for faster LTE Cat 4 networks. The second variant, for the Latin American market, will be powered by an NVIDIA Tegra 4i chipset. The different variants will not only feature different chipsets, but also in the camera: the Latin American variant will feature a 13MP sensor, while the international one will only pack a smaller 8MP unit. Other specs of the LG G2 Mini include a 4.7-inch 540 x 960 IPS display that supposedly covers over 70% of the front that allows it to be more compact in size, 1GB of RAM, 8GB of onboard storage with a microSD card slot, a removable back cover and removable 2440mAh battery, and a 1.3MP front-facing camera. LG is also shipping the G2 Mini with Android 4.4.2 KitKat, with its own set of new features, including the new Knock Code and Knock On/Knock Off gestures. Knock Code is a security feature that is similar to a PIN unlock, but without the numbers to tap. Instead, users will unlock their device with a “knocking” pattern on the lockscreen. While Knock Code does sound rather gimmicky, the Knock On/Knock Off is pretty handy – especially given that the power button on the G2 Mini is located at the back of the device. To wake the G2 Mini, users need only double tap the screen, and to unlock, a similar double tap anywhere on the homescreen will lock the device. 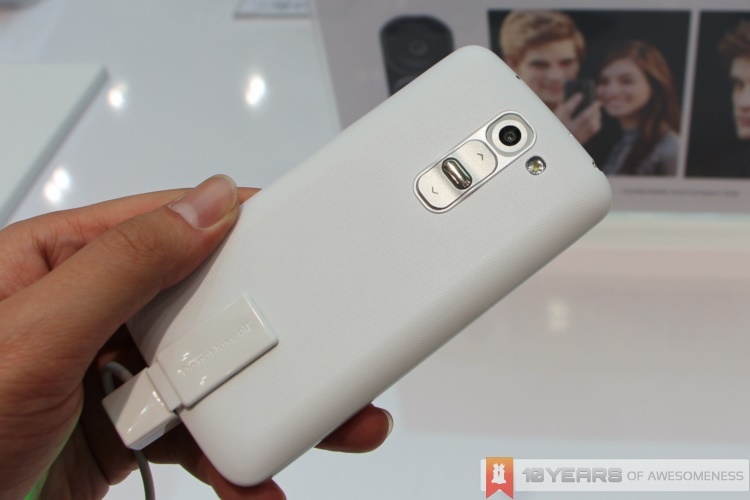 One area that LG’s improved with the G2 Mini is with the introduction of a matte, textured and removable back cover. The original G2 had a very glossy back cover, and the new back cover on the G2 Mini not only improves grip, but also prevents ugly fingerprint marks from appearing. Another thing that’s impressive with the G2 Mini is just how compact it is. At only 121g and 9.8mm thick, the G2 Mini is a very comfortable phone to hold, especially with its soft rounded edges and textured back. 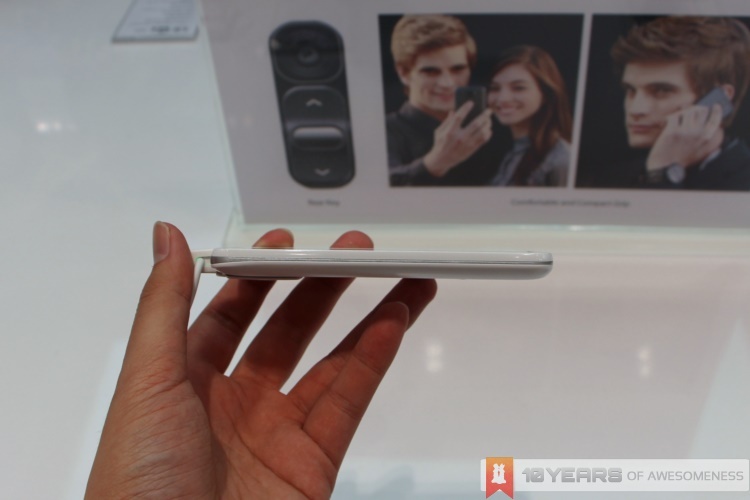 It’s even smaller than my Nexus 4 which features a similar 4.7-inch screen. 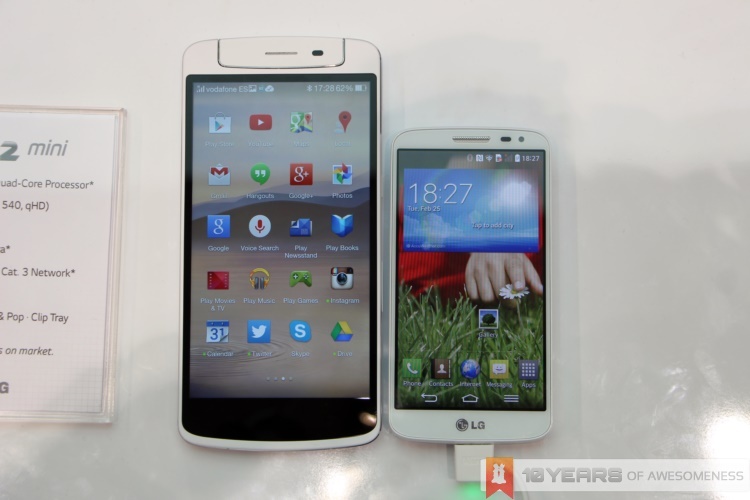 The LG G2 Mini will be available in four colours: white, gold, red and black, and global availability is scheduled from next month. 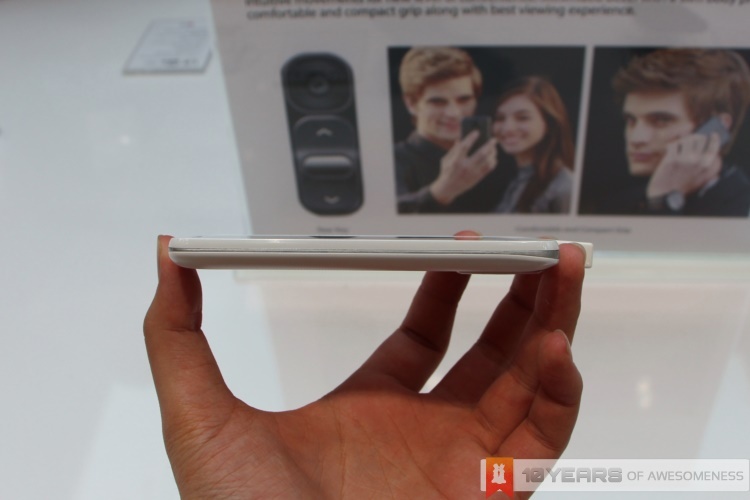 Knowing how slow LG Malaysia is, however, it is likely that we may only see this device much later…if at all. And that’s a pity, because the G2 Mini is actually a very nice phone.